The purpose of this study was to better understand how principals use teacher effectiveness measures to make talent management decisions such as hiring, placement, evaluation support, and leadership. Before we can target support to principals for using data for such decisions; however, we first need to know whether principals have ready access to data and in what form and what barriers may stand in the way of using these data. Our goal with this project was to understand these issues and then to propose a set of recommendations on developing processes, resources, and tools that can support principals in using measures of effective teaching and other data for strategic teacher human capital decisions. 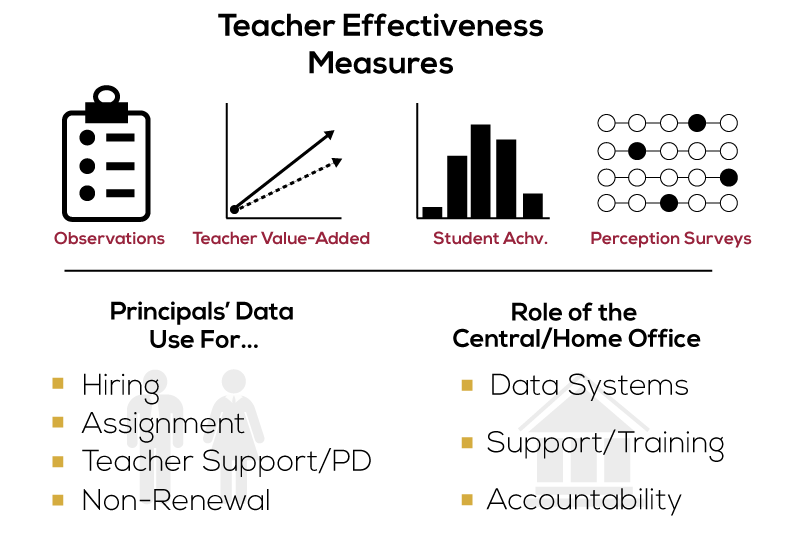 The resources provided on the website align with the graphic below, which demonstrates several key dimensions of this work: The inclusion of multiple forms of teacher effectiveness data, used by principals to make a full spectrum of talent management decisions, supported by central / home office personnel. A landscape analysis and needs assessment was generated for each of the 8 systems. This work was based on in-person interviews with system leaders and school principals; a short survey of principals; and collection and analysis of system and school artifacts related to principals’ data use. Three case studies of principals who are exceptionally effective users of data for teacher human capital decision- making, two of which were drawn from systems with few constraints for data use and two of which were drawn from systems with widespread constraints. A detailed timeline of the data use and decision-making cycles for each districts and charter network was synthesized from the data collected in the landscape analysis. Recommendation for support, resources, and tools to develop and enhance principal data use for teacher human capital decisions making, rooted in the findings from the three earlier work streams.